A 58-year-old woman has been waiting to be discharged from Glasgow Royal Infirmary for 209 days following treatment for a broken bones in her neck, it has emerged. The “scandalous” case of Janice Arundel was raised at Holyrood by Labour health spokesman Anas Sarwar. Ms Arundel, who is blind and has learning disabilities, first came to hospital in November last year after falling and breaking two neck bones. After treatment, she was cleared to leave hospital in April, but has since become one of 1,500 Scottish patients trapped in hospitals as a result of delayed discharge. Mr Sarwar accused Health Secretary Shona Robison of failing to do enough to tackle the problem of delayed discharge. He said: “Shona Robison’s delayed discharge record is nothing short of a scandal. The SNP promised to eradicate delayed discharge out of our NHS completely, but instead more than 1,500 patients were trapped in hospitals when they just want to go home. “One of those patients is Janice Arundel. She is blind, has learning disabilities and will turn 59 on Christmas Eve. Her clearly emotional and distressed brother Douglas came to my surgery to explain that Janice has been in hospital since November 2015, having fallen and broken two bones in her neck. “Janice was cleared to leave hospital in April and became a delayed discharge patient. She has been waiting 209 days at the Glasgow Royal Infirmary. It should not take a question in Parliament to sort that, but sadly it seems that it does - despite Shona Robison promising to eradicate delayed discharge. “This crisis adds more pressure to our hospitals, and our NHS staff who are over worked and undervalued by the SNP Government. But rather than give social care the funding it needs to deliver for patients, the SNP has hammered the budgets of councils which provide social care, with more than £500million cut in the last year. Responding to Mr Sarwar at First Minister’s Questions, Nicola Sturgeon acknowledged that Ms Arundel’s case was “completely unacceptable”. 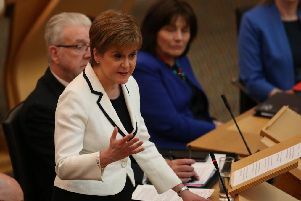 The First Minister said the Scottish Government was integrating health and social care in an attempt to solve the problem.